Hello again. This is starting to become a habit this posting multiple times per day I hear you say. I just came back from my fifth sauna session. I managed to increase my sauna time to 40 minutes, with a temperature ranging from 81C (177.8F) at the start of the session to 86C (186.8F) at the end of the session. I was looking at the sauna training plan of a Badwater competitor and he maxed out at 45 minutes, so I think that will be my final aim. This time I didn't leave the sauna at all. The last few minutes were tough but manageable. It did take quite a while afterwards though before I stopped sweating. Once again I drank solely water mixed with a sachet of Bios Life Matcha. Several hours later and I can report back no negative side effects. I feel pretty darn good in fact, although maybe ever so slightly sleepy. Wow, that’s amazing! The longest time that I stayed in a sauna room was 30 minutes, if I remember it right. Anyway, I think to constantly aim to break your record is a nice thing. Though, if you really plan to push the limit, I suggest you drink a lot of water before going in. The last thing you’d want to happen is to pass out due to dehydration. Hi Neil. 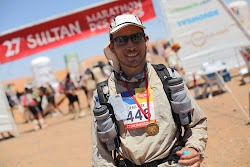 Yes the sauna training prepared me very well for the Marathon des Sables. I did not find the heat as extreme as some of the others did. I used to take a large bottle of water into the sauna with me, and sip it constantly. I havent used the sauna much since the Marathon des Sables, but we will probably be using the sauna a lot when I ski from one side of Finland to the other in March.